It’s Thursday again, and I held my little cooking class with my 5 y.o. and her friend. This week I decided to let them do pizza, and tell them the story of Niccolò Pesce or Colapesce. The legend of Niccolò Pesce, known as Colapesce or “Nick the Fish” as he was such a good swimmer, originated in the Middle Ages. It was said that the young man had webbed fingers, fins and scales: half man and half fish, he could live at the bottom of the sea. Colapesce lived in the sea between Naples and Messina (Sicily), which is why the king of Naples once invited him to go down into the depths and see what secrets they hid. Colapesce told the king that the bottom of the sea was covered in priceless treasure; when he came back up he brought huge amounts of jewels he had found in the caves and channels under the island of Megaride. 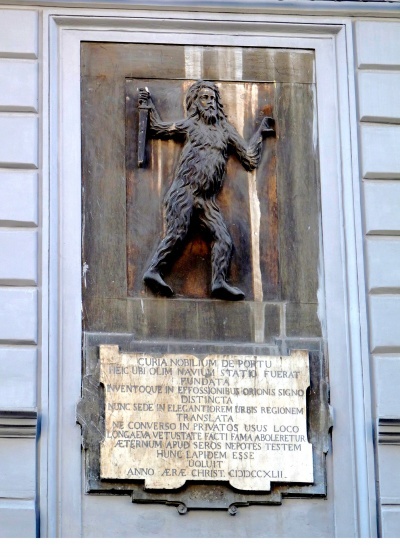 Here’s an image of a bas-relief on the front of a building in via Mezzocannone, which shows a bearded, hairy man with knife in hand, is thought to be Colapesce. This is because people in XVII century remembered him as a wild-looking man who sometimes came up from the sea to talk to sailors and tell them what he had discovered. This man became the symbol for the Port area. A simple pizza made with instant yeast, easy enough for little children to make! Turn the oven on to 425º F.
Place a pizza stone in the middle of the oven, if you have one. Otherwise prepare the pizza in a cookie sheet. Combine 1 cup of flour, the yeast, sugar and salt. Add the water (or water and white wine) and oil, and mix well until all the flour is incorporated. Keep adding flour, 1/2 cup a time, until the mixture is pliable and not sticky anymore. Be careful it doesn't turn too dry. Once you have the desired consistency, keep kneading with your hands until the dough springs back then poked. At this point you can either divide the dough to make 2-8 inch pizzas, or 1-12 inch one. As I was preparing the dough, I had the girls shred the cheese, which gave them something to keep them interested. I diced the Canadian bacon and sliced the mushrooms for them. Prepare a pizza peel or a thin wood cutting board with cornmeal to make the pizza. Or our can shape the pizza and place it on a large cookie sheet. To shape the pizza grab the ball of dough and gently pull at the sides, making a larger circle each time. You can also work the dough in circles, as if you were holding the steering wheel of a car. Once the pizza circle is ready, place it on top of the pizza peel or the cookie sheet to put the toppings. On top of the pizza dough, spread the pizza sauce from the center outwards. Then sprinkle the Canadian bacon, mushrooms and the shredded cheese on top. Finally, put the dash of garlic powder on top of it all. If you want to make a more traditional Italian PIzza, you can just use fresh mozzarella and top your pizza with sauce, cheese, sliced tomatoes and shredded basil. If using the cookie sheet, get in the oven. If using the pizza peel and the baking stone, open the oven and slide the pizza with a gentle tug to transfer from the peel to the stone. Bake for approximately 13-15 minutes. If using the peel, get the pizza off of the stone using that or a cutting board. If using the cookie sheet, transfer to a cutting board and slice your pizza while it is still hot. Then... ENJOY! The girls loved their pizzas and couldn’t believe they had made them themselves! A truly Italian pizza with Canadian bacon? Interesting! And well… you’re absolutely right 🙂 The Italian topping should have been pepperoni, but my daughter prefers Canadian bacon. But pizza is most definitely Italian.